Parents are encouraged to come into the hangar at any time to observe - but in particular it is a good idea to come into the hangar about 9:00 p.m. where announcements and signups are taking place so that you can be aware of all upcoming events. CO's Parade (CO = Commanding Officer) takes place the first Tuesday of each month. Parents and family are welcome to come in and take a seat, observe the formal parade and inspection by our CO Capt Brenda Aumonier (and often a guest). This is usually the time that rank advancements will take place, as well as presentation of special awards or medals. Please attend, you are never sure if your cadet will be a deserved recipient! Cadets please bring $1 or $2 for canteen/snack. Announcements regarding CADET EVENTS will be announced on Tuesday nights. To stay informed and receive accurate information, come into the hangar for opening and/or closing ceremonies each Tuesday night. Tuesday night announcements. We encourage all parents to come in every Tuesday night to watch the squadron “fall in” at 6:15 and again at 9:00. 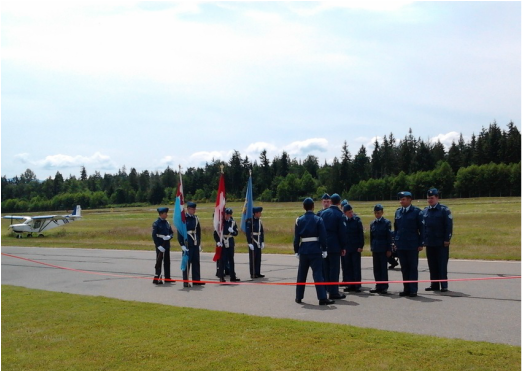 Squadron Announcements are presented at the end of “fall-in” as well as warning orders. PLEASE join us. If you have any questions or would just like to sit and have a coffee/tea and chat, you are always welcome to join us in the Sponsoring Committee office! We have an updated calendar in the hangar lobby, and we will be posting pertinent information on our bulletin board outside the office regularly. All activities are listed in the Squadron Calendar. Gliding - once in the fall, once in the spring. Takes place at Comox. Bus picks up and drops off at the squadron. It is an all day event. Tag Day - Major Fund Raiser. Once in the fall, once in the spring. Cadets in Uniform are given a designated spot in Qualicum Beach or Parksville to collect donations. This is one of the easiest fundraisers our cadets do. Second year and above Cadets qualify for a range of camps. 3-6 weeks can be Comox, Cold Lake, Albert Head, St. Jean, Quebec and International. “Warning Orders” are given out for any off site activities. It gives instructions on the event and there is a permission slip to sign and return. Cadets will receive warning orders the Tuesday before the activity. It is IMPORTANT that you are in the hangar to get accurate information and ask questions if you have any. As a Sponsoring Committee we need to raise annually approximately $40,000 to fund the hangar and the Cadet activities. We need ALL parents to participate. We have a large selection of activities that require some sort of parent involvement. Each family is required to participate in 75% of the fundraising activities throughout the year and ALL parents are required to assist with the Annual Cadet Review at year end. On the last Tuesday of each month between September and June we have a Parent and Sponsoring Committee Meeting. You are invited and encouraged to attend these short meetings. Many decisions are made at these meetings that affect YOUR cadet. Make sure your membership is up-to-date and share your views and votes!